Be the first to share your favorite memory, photo or story of Madeline. This memorial page is dedicated for family, friends and future generations to celebrate the life of their loved one. 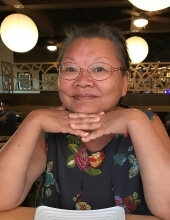 On Monday, January 21, 2019, Madeline Kwong passed away peacefully at home at the age of 68. Madeline will forever be loved and remembered by her husband of 46 years, James, and her children, Jennifer Stocks, Jolina Kwong Caputo (Josh), and Jake Kwong. Madeline will also be remembered by her four grandchildren; Leah, Henry, Avery, and Monty, and by her brother Matthew (Gei) Chan. A funeral service in memory of Madeline will be held Thursday, January 31, 2019 at 1:00pm, at the Creekside Community Church, 333 NE Evans St., McMinnville, Oregon 97128, with a reception to follow. The family are sensitive to flowers, so no arrangements, please. If you feel inclined to bring/send something, Madeline loved succulents. To send flowers or a remembrance gift to the family of Madeline Kwong (nee Chan), please visit our Tribute Store. The family are sensitive to flowers, so no arrangements, please. If you feel inclined to bring/send something, Madeline loved succulents. "Email Address" would like to share the life celebration of Madeline Kwong (nee Chan). Click on the "link" to go to share a favorite memory or leave a condolence message for the family.